I’m not afraid of flying in the least, but now that I’m older I prefer the aisle seat over the window. More leg room. I feel like I could write about plane experiences all day long. Especially as a foreigner on an Asian airline. I go back and forth about how to talk to the flight attendants—Chinese or English—in my head, and no matter what I choose, they use the opposite to respond. I don’t get it, either. People are fun, too. Just like anywhere in mainland China, if there is the slightest chance of standing in a line everyone and their brother will fight to the death to be the first in it. Of course all this accomplishes is a long, crowded, irritated line where people are just holding their carry-ons and staring at one another for ten minutes. The other day I looked up how to say, “Don’t push me,” surprised I had never used it before. In fact, to this day, I’ve never heard anyone utter the words. It reminds me of the time I asked my friend how to request privacy when speaking with a doctor. She looked at me, baffled for a moment, and then told me that Mandarin doesn’t have that word. She was serious. Now of course they do have the word for privacy, and even a really indirect way to ask for it, but the fact is, when asked, she had a hard time thinking of a response, and it wasn’t due to poor English skills. It’s because they just don’t consider an individual person’s personal space. I haven’t gotten a chance to ask for privacy with a doc, but next time I need to see one you can be sure I’ll be shooing the half a dozen strangers lurking in the room out of it. 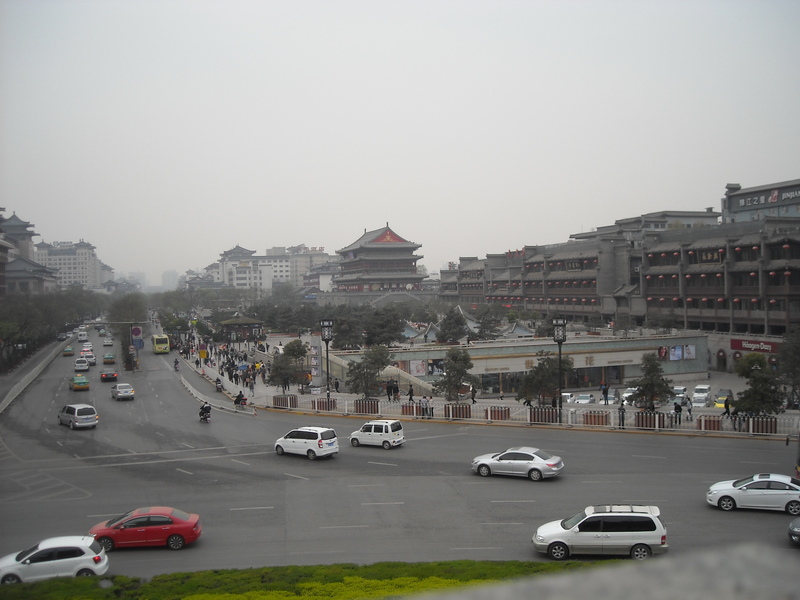 The trip from Dalian to Xi’an, one of the ancient capitols of China, was pretty quick. Only about 2 hours. Just like in Kunming, a shuttle bus from the airport got us to the hostel. This hostel, like many of them, is located on a skinny back street that many would just pass by without a second glance. I like narrow streets. People are forced to interact, children play in them and tangle with the “adults,” and when a little restaurant has an outdoor area almost everyone on the block is there chatting and eating. Skinny streets have a lot of life. The Han Tang Hostel, not to be confused with the Han Tang Inn located 100 meters away on the same street, is a hostel to contend with. You walk in and realize you could be in a bar, restaurant, or some snazzy hotel, not just a haven for the weary trekker. Every week the place hosts “events and outings” for their guests at no cost. 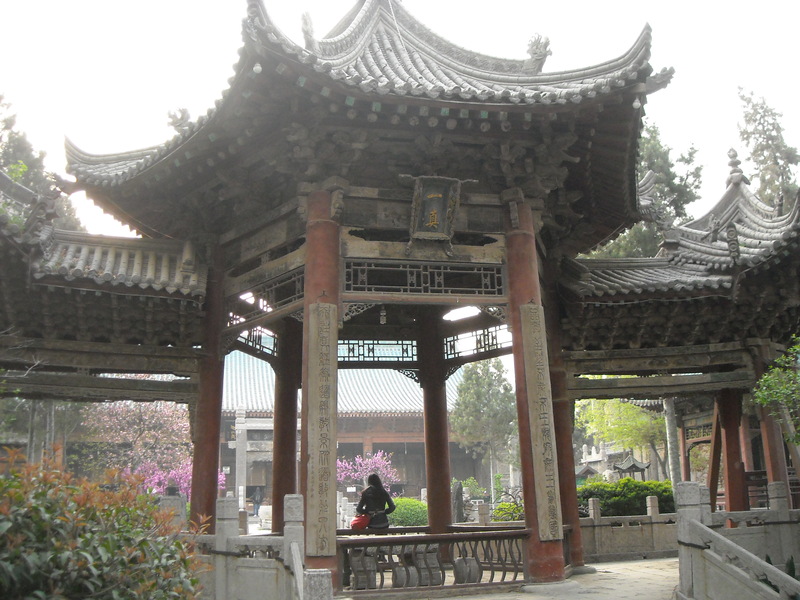 A trip to the Muslim Quarter, Tour of the Wild Goose Pagoda, Dumpling Making Night, Live Music, etc. The food is Western style, and even though it’s a bit overpriced, it’s freakin’ good. The rooms themselves are comfortable, too. You’ve got your normal choices: dorm of 4-10 beds, doubles, or privates. Always go with the dorms, guys. Why travel if you’re just going to be a strange loner. The beds are bunk-beds that are almost too comfy, and the shower is AMAZING. It was better than two of my old apartments’. Just saying. Friendly staff with buttloads of intel on the area, and ridiculous work ethic. Seriously. One girl who checked us in around 1 pm and closed that night at midnight also opened the next day at 6 am. The girl’s a beast. We dropped our stuff in our room and got cleaned up. Ever notice when you travel you just feel like you need a shower even if you took a shower that morning? Once we were good to go we checked out a few nearby sights. 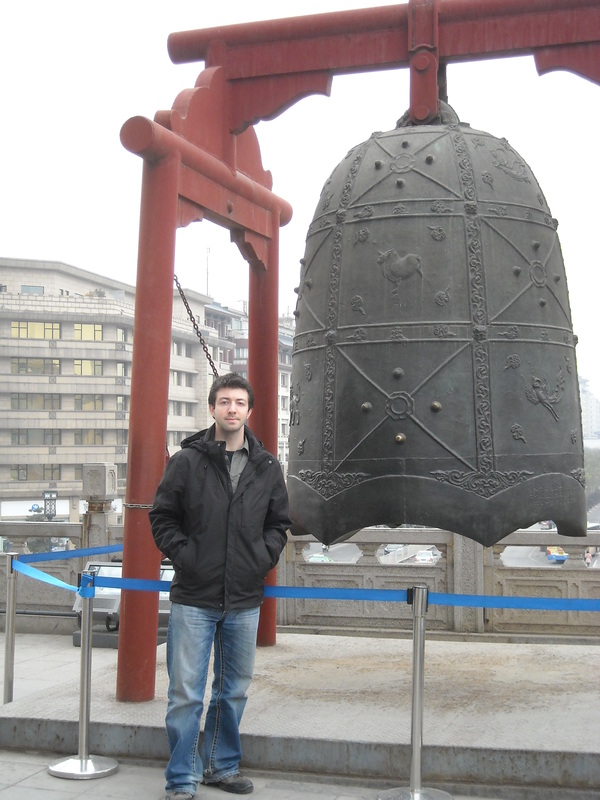 We got to the Bell Tower and the Drum Tower, two largely remodeled and refurbished structures that served true and useful purposes back in the day, around the Ming Dynasty. Today they are about a block apart and a large, busy intersection separate the two. A fancy looking shopping center sits behind the Drum Tower. 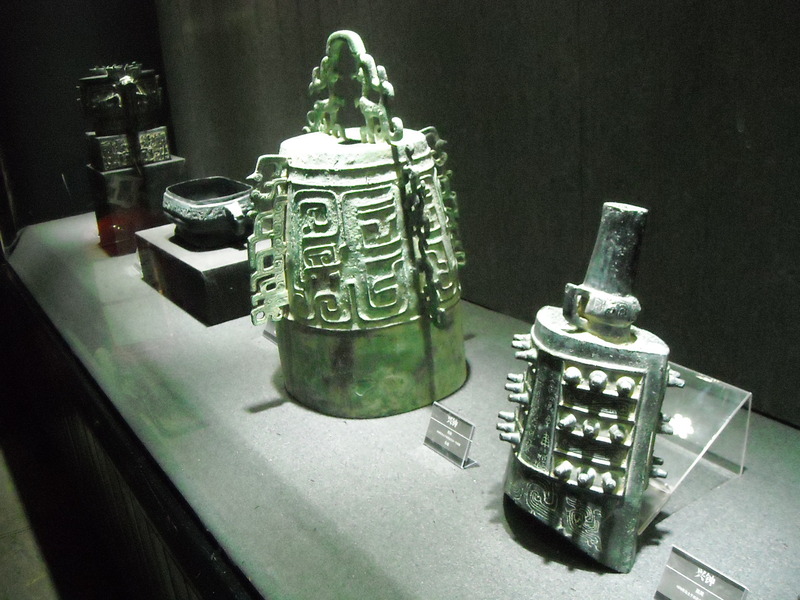 At both there are ancient relics from the past, as far back as the mythical Xia and Shang Dynasties, about 5,000 years old. 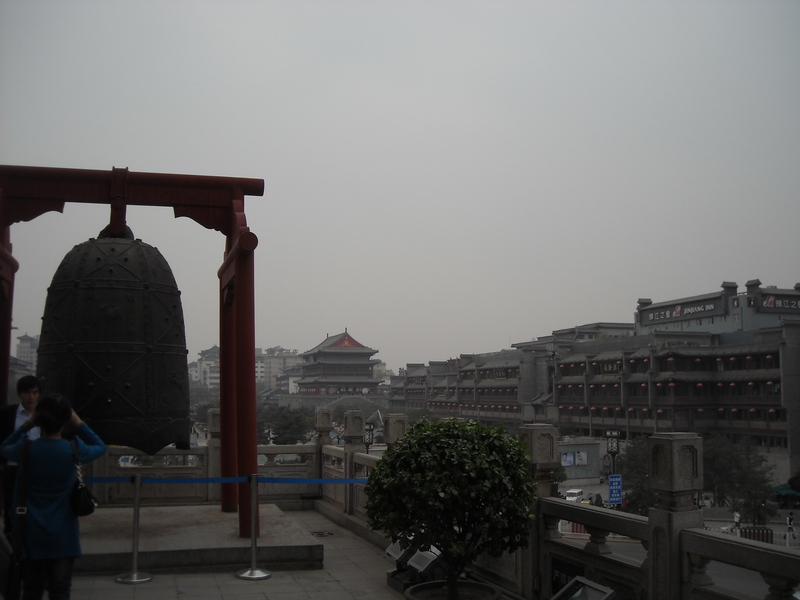 At the Bell Tower there is a complete replica set of bells that were dug up from the first emperor’s tomb, Qin Shi Huang. 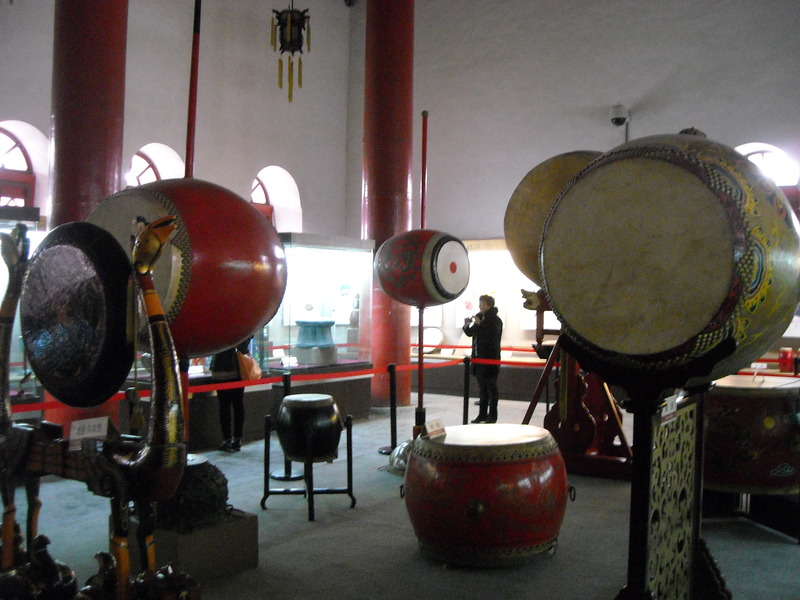 We caught a Bell ringin’ show, complete with a few other traditional Chinese instruments. They played two legitimate Chinese songs, and then on the third one I found myself humming along…because they were playing “Old Lang Syne,” the New Year’s Song. Yup. At the Drum Tower it was much the same, except for, you know, the show being a Drum show. 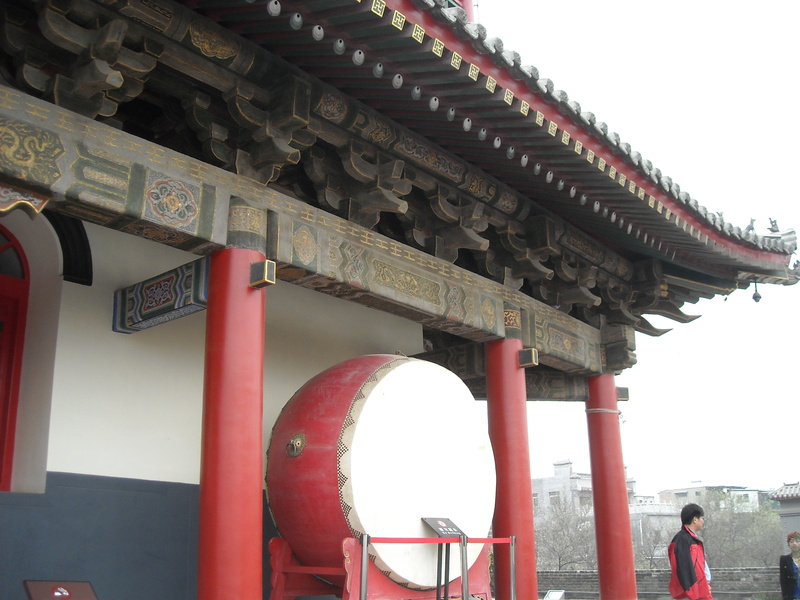 That in the distance there is the Drum Tower…. But at both places I picked up some souvenirs. Two that I got for my mother and brother I picked up from a woman with Ox Bone necklaces. She was a tough old bird who I worked on for a bit before I got her from 63 Rmb to 35. There was this really cool eagle carving that had the head of an eagle and the bottom part was a talon. It reminded me of my brother’s tattoo, so that was his. My mom’s was a necklace that had the two characters for “Peace,” “ping,” and “an.” The woman wanted 28 for my bro’s and 35 for my mom’s. We had scanned them without much comment accept to ask the price before going to see one of the towers, but then we came back on our way out. It’s my “Haggle Policy” to never come back to a merchant once you’ve already walked away, but since I hadn’t really initiated a negotiation with her the first time, I let the rule slide. Plus, I wanted them. I started looking around at other carvings I knew I didn’t want, asking prices and holding them up to my neck. I eventually asked about both of the ones I did want, but passed over them nonchalantly. When I picked up one (that I didn’t want) and asked about the price I tried to haggle her down without much success. I gave in easily and set it down. Then, acting like it was my consolation prize, and catching the look in her eye that said, “Buy something, Pleeease,” I picked up the eagle one and asked. I asked her to come down a bit and she did, a little. I then made a move to group two together for a lower price. She was for it, but still wanted too much. When I finally snatched up the two I actually wanted we had been going around for about ten minutes, with me “almost” walking away. She was eager to sell something at this point. Being a foreigner speaking and negotiating in Chinese, I had brought a bit of a crowd to the table. This wasn’t good. She was representing China now. So she didn’t want to bend. So I cooled it, and bided my time. Once most of the others had wandered off I began talking to my friend about how these would make good gifts for my mother and brother. The woman perked up then. The Chinese are Big into family. You have no idea. So then she started helping looking for other nice ones and we reentered into the wheelin’ and dealin’. When I got her down to 45 she was pretty hard looking. She kept waving her hands, and my friend said that was the best. It wasn’t getting’ any prettier. Then I told the woman in Chinese what I told the man in Thailand using English. “35 and I’ll buy these right now.” I added that they weren’t for me, but for family, and….she caved. And then I had them carve “Xi’an” into the back of my brother’s necklace just for good measure…and the memories. My friend couldn’t believe I got her so low without the merchant being royally pissed, but I knew it was fine. She wouldn’t have kept talking if she wasn’t willing. And plus, in the time we stood there she sold a bunch all because we were creating a crowd. Don’t look at me like that; saving money on vacation is a tricky endeavor. 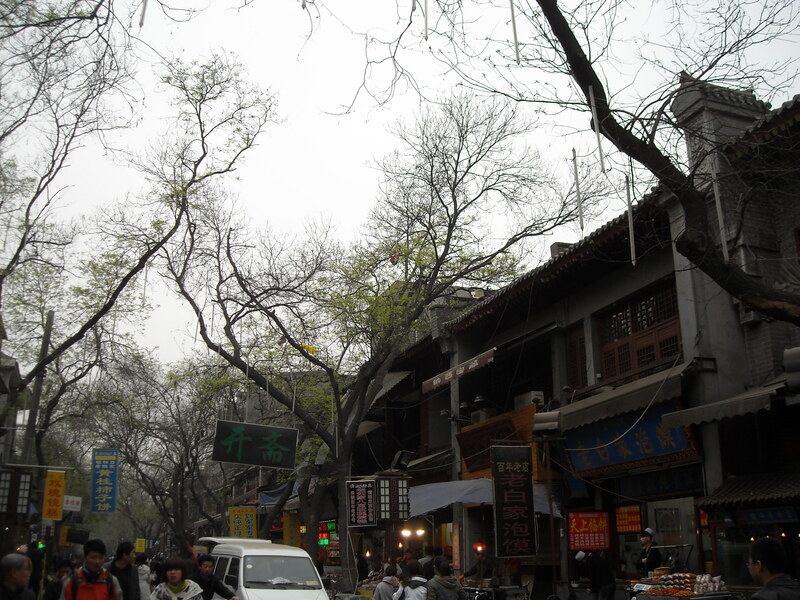 We wandered around the streets then, taking in some local scents and scenes. 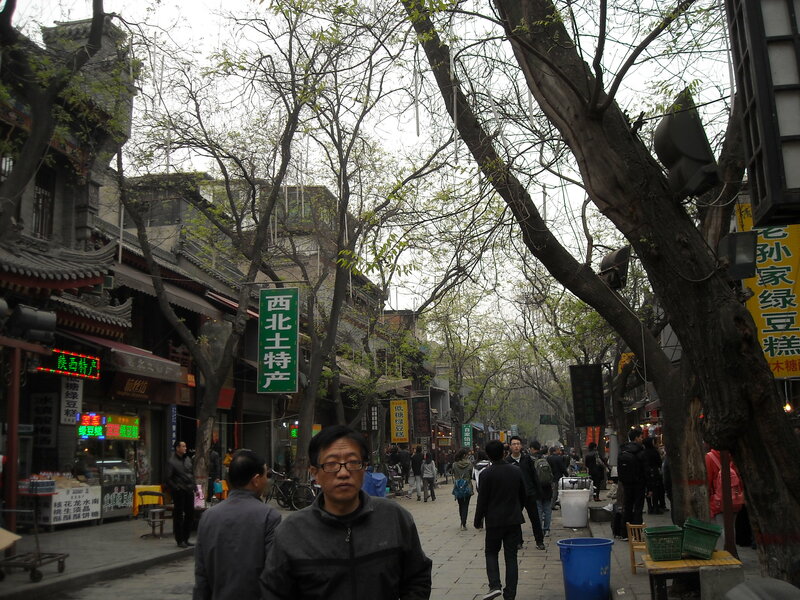 Another skinny street with a bunch of merchants, restaurants, and overhanging trees…and people, people, people. There’s an idiom in China that goes, “People mountain, people sea.” It basically means there’s a lot of flippin’ people. But you already knew that. We headed to the Great Mosque next. It wasn’t far, just a few blocks away. We had to shimmy and shuffle through tightly packed alleys with a million merchants hawking their wares. 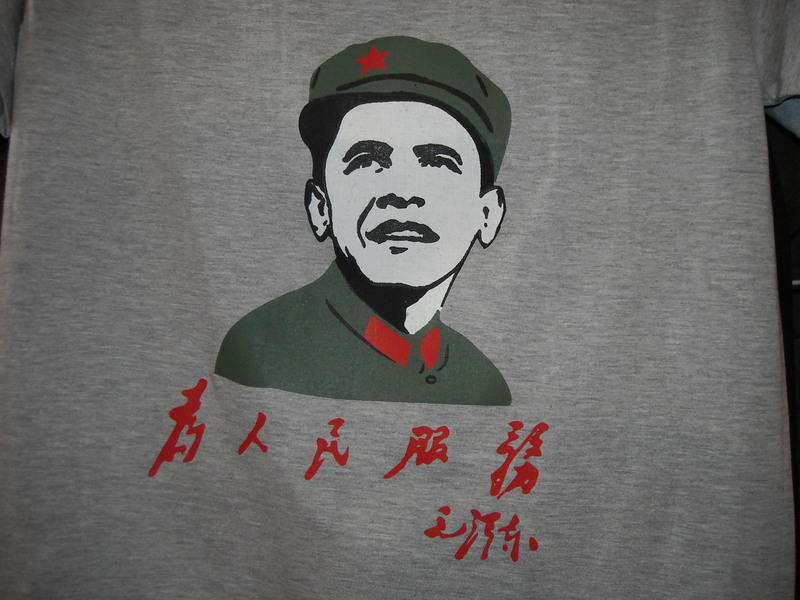 Everything from imitation Dynasty currency to T-shirts sporting Obama with communist slogans on them could be seen. Once we got through it all, though, we came to the “Great” Mosque. With a name that literally brags about its awesomeness, I was expecting something…greater. “Wei Ren Min Fu Wu” “Dedicate service to the people.” This is a phrase good ol’ Mao made well known. It’s a phrase still used by the military. The Mosque is definitely an ancient, meaningful, still-in-use place of worship, but when you hear Mosque certain images are conjured. What I saw fit none of them. 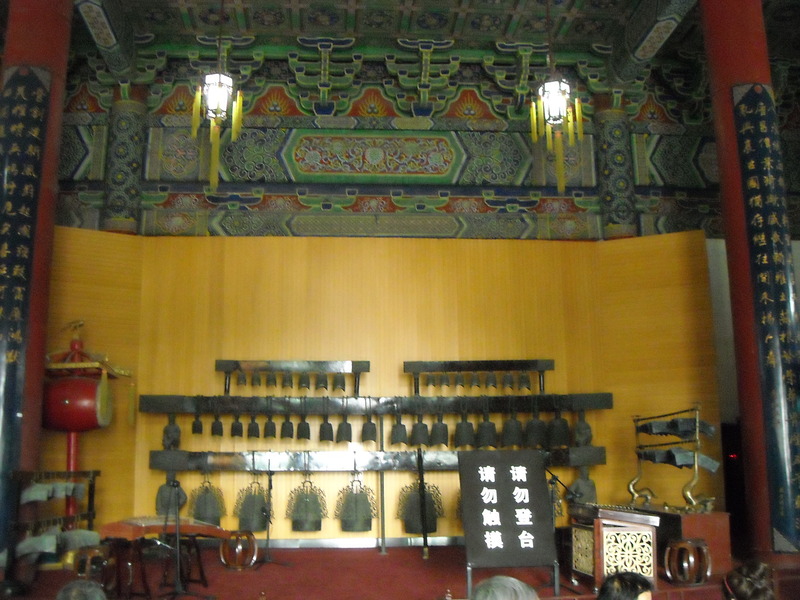 The whole place is Chinese style. 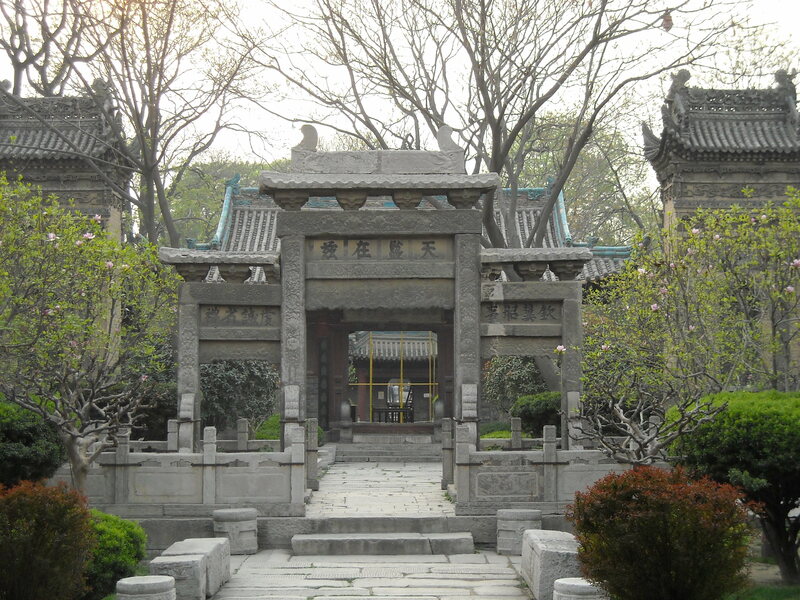 Built in a long rectangular shape with big open-air courtyards and symbolic gazebos and stone tablets, the place looked more like what you’d see in an old Kung-fu movie, not the Middle East. The kids were with one of the very few Western families we saw. The bother and sister were running around the courtyards chopping at each other. The business men seemed to have just finished up with a meeting and were walking around in a herd. The wooden sign peaked over the stone walls of the Mosque and made sure we knew we were in the 21st century. Afterward, we hiked it to the South Gate of the City Walls. 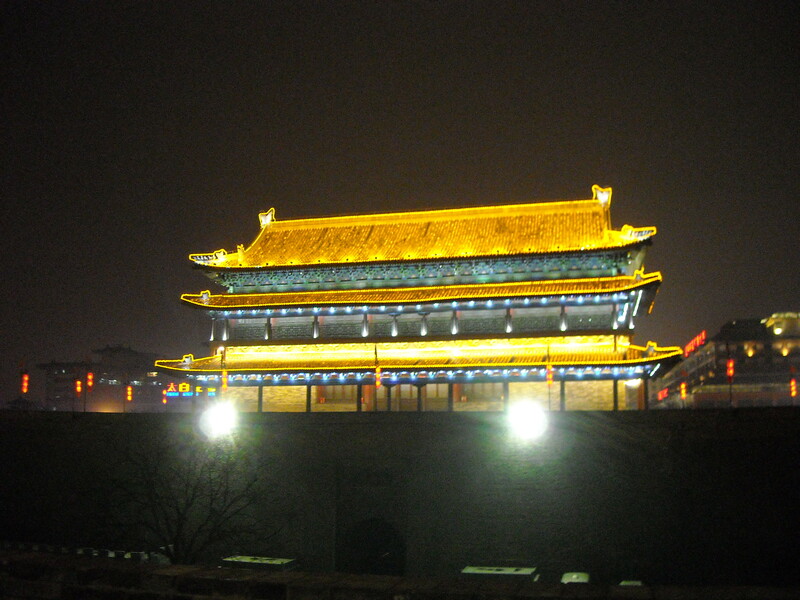 Xi’an’s City Walls are, I think, the only fully intact city walls. 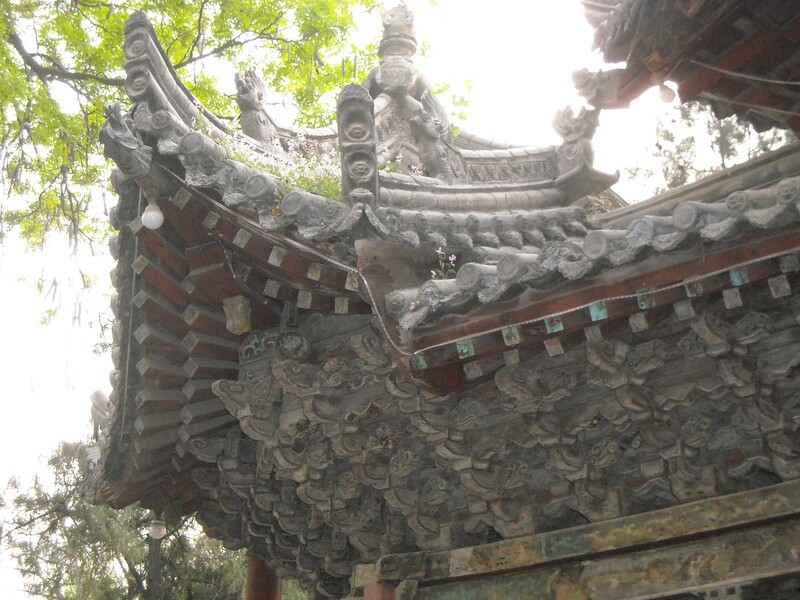 The existing wall was started by the Ming Dynasty in 1370. It encircles 5.4 sq mi, a much smaller part of the city than the original. The wall measures 8.5 mi in circumference, 39 ft in height, and 49–59 ft in thickness at the base. We got there around 6:45 and bought a ticket to get in and walk on the walls, but renting bikes and riding along the whole perimeter was our goal. Problem was, the rental place turned us away because they were closing at 7:30 and it takes 100 minutes to cover the whole wall. We went back down, told the other people, the gate people, the problem, and they just said we should have still been able to rent the bikes up until 7:30 with no issue. We ended up wasting 15 minutes arguing with them to either give us our money back or just let us ride the damn bikes. It was actually a good set up because the gate people sold tickets to get in and walk on the walls. Technically they had fulfilled their side of the bargain. The bike people were a separate organization that owed us nothing. In the end, they rented the bikes to us for 50 minutes and grumbled about just wanting to get off work. We took the bikes and zipped off into the fading light as evening truly descended. It felt great riding on the walls at night when no one else was there. We could even see a few stars, something that’s actually more amazing than you might think…especially in a Chinese city. We rode along for a while, picking up speed and just watching as parts of the city passed by. And then, around 7:45, we peaked behind us and noticed an electric cart following us. We kept going, but eventually they caught up and told us we needed to hop on with them and ride back. They wanted to get going. The whole time they’re talking to us I’m circling them on the bike. I ask my friend what time it is, and then I say, “Okay, see you back there.” I take off back in the direction we had come and dart through the night. I ride as fast as my legs can take me, looking back just a few times. The cart didn’t even come close to me. The cool air is circulating in and out of my lungs, my legs are burning, and I’m fairly certain the chain on the bike is about to bust any second…but I keep going. Something about the whole hassle with them closing earlier than they should have, the way they just were jerking us around…it propels me like a bat out of hell. I made it back to the bike rental place and had enough time to hop off and put the bike back in the line where it belonged before the cart rolled up. The two workers look like they want to lop me off the side of the wall, but my friend just smiles at me and says, “You’re awesome.” I ask her what happened when I took off and she says they were irritated, but when they tried to catch up to me they couldn’t. Immature? Probably. Would I do it again? You bet I would. Of course that night I began coughing. It would be the start of a two week cold that I’m pretty sure I deserved. When we got back to the hostel we found that we shared the room with a Chinese guy, a Chinese couple, and two Norwegian girls. With day one down, we grabbed some western food, more showers, and slept like babies in the bunk beds. 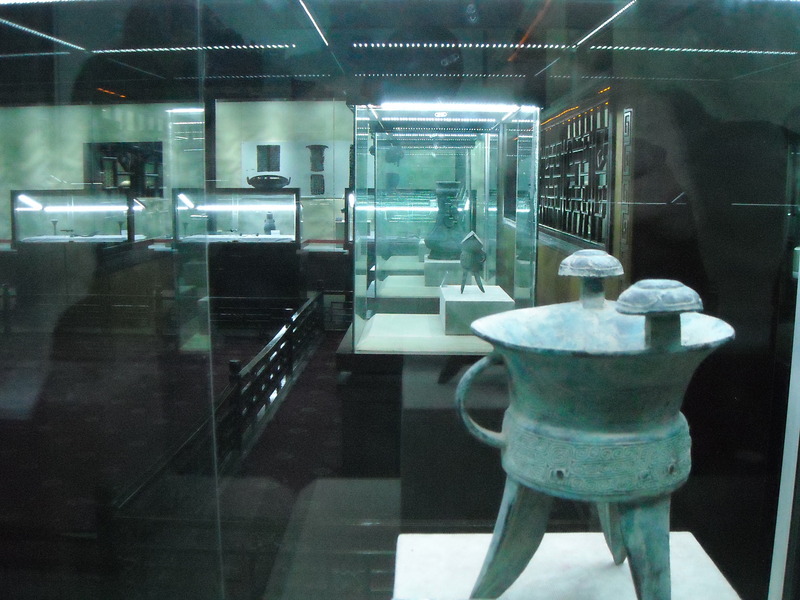 Day Two would be the day we saw the Bing Ma Yong, Terra Cotta Warriors. Xi’an Day Two and the Bing Ma Yong: featuring Bragon and the Big Duck.